In 1980, before living simply and green; became trendy and popular, Doris Janzen Longacre, author of the enormously popular More-with-Less Cookbook (over 900,000 sold), wrote Living More with Less, a practical guide for living in simple, sustainable, and healthy ways--ways that keep the future of the planet, and the plight of poor people, in mind. 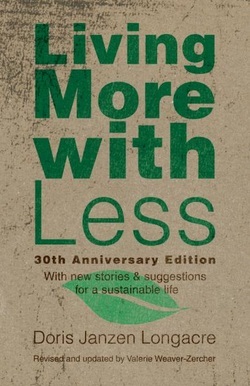 Thirty years later, Living More with Less 30th Anniversary Edition is being released as a way to celebrate and honor Longacre's foresight and vision, and to pass on her vision for simple and sustainable living to a new generation. Revised and updated by Valerie Weaver-Zercher, this 30th anniversary edition is true to Doris Janzen Longacre's spirit of living in ways that keeps poor people, God's creation and each other in mind--and is loaded with new and practical tips in areas such as money, travel, clothing, housing, celebrations and recreation. By Doris Janzen Longacre. 252 pages. Herald Press. 2010. 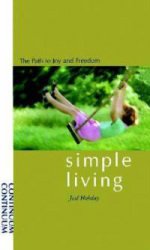 As Janet Luhrs says, "Simple living is about living deliberately. Simple living is not about austerity, or frugality, or income level. It's about being fully aware of why you are living your particular life, and knowing that life is one you have chosen thoughtfully. Simple living is about designing our lives to coincide with our ideals." 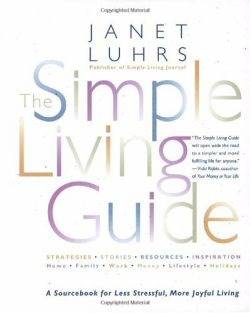 In The Simple Living Guide Janet Luhrs demonstrates how to live a deliberate, simpler life--and savor it. By Janet Luhrs. 444 pages. Broadway Books. 1997. www.simplicityjourney.com. Most of us living in this complex and time-pressured era have moments when we wish we were living simpler, more meaningful lives. Sometimes these wishes are fleeting desires, but for many today the search for a life of greater simplicity and meaning has developed into a deep longing. There are many routes to simplicity. This book focuses on and provides direction to the gimmick-free spiritual path followed by Quakers. 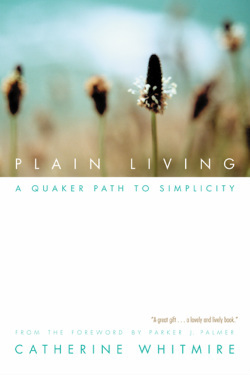 For over three centuries Quakers have been living out of a spiritual center in a way of life they call "plain living." Their accumulated experiences and distilled wisdom have much to offer anyone seeking greater simplicity today. Plain Living is not about sacrifice. It's about choosing the life you really want, a form of inward simplicity that leads us to listen for the "still, small voice" of God. This book goes beyond the merely trendy to make the by now well-worn Quaker path to plain living accessible to everyone. By Catherine Whitmire. 192 pages. Sorin Books. 2001. Confucius, Patanjali, Ovid, St. Matthew, Milarepa, Rumi, Eckhart, da Vinci, St. Teresa of Avila, Basho, Thoreau, Tagore, Suzuki, Illich, and many others share profound thoughts on our wants and needs, lifestyles and lifeworks. Here is a book to be savored in quiet moments when we reflect on our hectic pace of life; when we wonder if the race to riches is worth the struggle; or when we wonder if the earth can sustain our greed for many more generations. Edited by Goldian Vandenbroeck. 316 pages. Inner Traditions Intl. 1996. 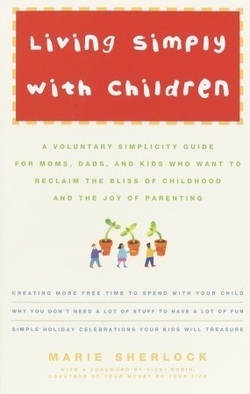 Including sections on limiting television, environmentally friendly practices, celebrating the holidays, and tapping into the growing community of families who embrace simplicity, this inspiring guide will show you how to raise children according to your own values—and not those of the consumer culture—as you enjoy both quality and quantity time with your family. By Marie Sherlock. 304 pages. Three Rivers Press. 2003. 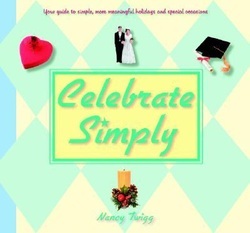 Can celebrations be simple, yet significant? Certainly! And Celebrate Simply shows you how. By Nancy Twigg. 224 pages. Kregel Publications. 2006. Simple living is not only a philosophy, but the story of the life of Native American and Franciscan sister José Hobday. Simple living is a way of life—an inner stance, an attitude, a disposition. It is a discernment about priorities in one’s life. It is not just about material possessions but about freedom: freedom from and freedom for, freedom for what you love and want to do and how you can keep on doing it. Finally, here is a groundbreaking work that goes beyond the books that tell you why to simplify and how to simplify your life. This is the book that tells all-what has really happened in the lives of real people who have done it. How does simplicity translate in our modern day-to-day world? Can people who embrace this lifestyle sustain it over time? What are the downsides? Is it worth it? Do they miss the "old way?" 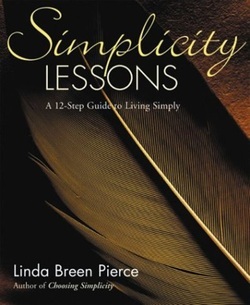 These are just a few of the questions explored by Linda Breen Pierce in Choosing Simplicity. And she should know. Pierce spent three years studying people who have simplified their lives-over 200 people from 40 states and eight countries. She found people living simply in the country, in large cities, and everywhere in between. 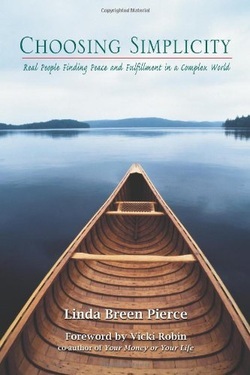 Interwoven throughout the stories are the author's insights and lessons to guide those who want to explore simplicity and to sustain those who have already embarked on this journey. The book also includes a 16-page Resource Guide with summary reviews of 42 books on simplicity, information on related web sites, organizations, simplicity study circles, workshops, newsletters and magazines. By Linda Breen Pierce and Vicki Robin. 348 pages. Gallagher Press. 2000. 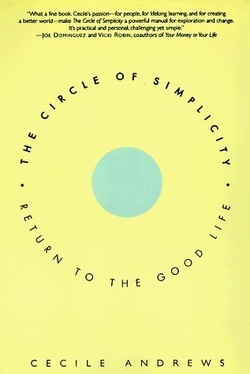 When Voluntary Simplicity was first published in 1981, it quickly became recognized as a powerful and visionary work in the emerging dialogue over sustainable ways of living. Now, more than ten years later and with many of the planet's environmental stresses having become more urgent than ever, Duane Elgin has revised and updated his revolutionary book. 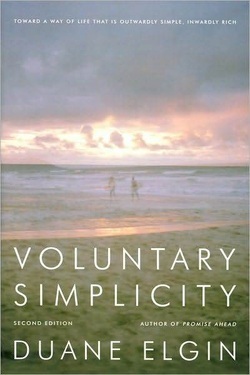 Voluntary Simplicity is not a book about living in poverty; it is a book about living with balance. It illuminates the pattern of changes that an increasing number of Americans are making in their everyday lives -- adjustments in day-to-day living that are an active, positive response to the complex dilemmas of our time. By embracing, either partially or totally, the tenets of voluntary simplicity -- frugal consumption, ecological awareness, and personal growth -- people can change their lives. And in the process, they have the power to change the world. First published in 1981, Voluntary Simplicity was instantly recognized as a visionary work. The New York Times called it "seminal"; the Wall Street Journal noted that it was "considered the movement's Bible." 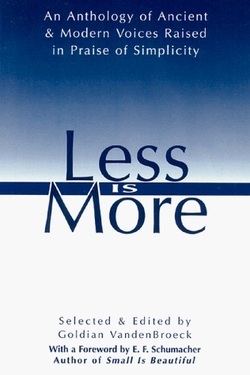 Revised in 1993 to address the trend toward downshifting, this pertinent book helps us to adjust our thoughts, habits, and goals and embrace the key elements of simplicity: frugal consumption, ecological awareness and personal growth. By Duane Elgin. 240 pages. Quill. 1993. Simplicity Lessons is a practical guide for those who long for a slower pace of life with more time for joyful relationships, fulfilling work, and living one's dreams. Working on your own or as part of a simplicity study group, you will explore the major areas of your life: material possessions, money, time, work, housing, transportation, relationships, inner simplicity, health, community, and environmental sustainability. For each category, you will complete written exercises to determine how best to improve the quality of your life. By Linda Breen Pierce. 240 pages. Gallagher Press. 2003. By Cecile Andrews. 288 pages. HarperCollins. 1998. Don't give up your simple dreams just yet! 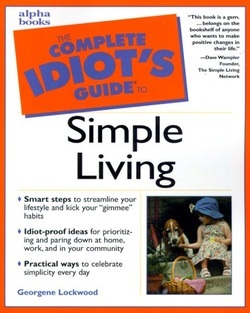 The Complete Idiot's Guide to Simple Living shows you easy -- not extreme -- ways to nix the unnecessary so you can enjoy the really important stuff. By Georgene Lockwood. 352 pages. Alpha Books. 2000. Additional books can be found in the Small Group Programs section.